This is CHAMP: Boeing's new missile otherwise known as the Counter-electronics High-powered Microwave Advanced Missile Project. It automatically disables PCs and other electronic devices as it soars through the skies, using a burst of powerful radio waves—and it was successfully tested last week. 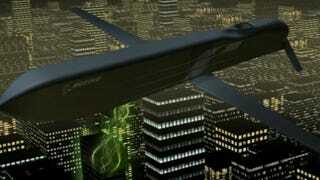 "This technology marks a new era in modern-day warfare. In the near future, this technology may be used to render an enemy's electronic and data systems useless even before the first troops or aircraft arrive.... [W]e made science fiction science fact."